This book combines chapters written by leading social psychologists and economists, illuminating the developing trends in explaining and understanding economic behavior in a social world. It provides insights from both fields, communicated by eloquent scholars, and demonstrates through recent research and theory how economic behaviors may be more effectively examined using a combination of both fields. Social Psychology and Economics comes at a particularly fitting time, as a psychological approach to economics has begun to flourish in recent years, and papers exploring the intersection of these two disciplines have appeared in peer-reviewed journals, opening a dynamic dialogue between previously separated fields. This volume, the first in the Society for Judgment and Decision Making Series since acquired by Psychology Press, includes chapters by economists and psychologists. 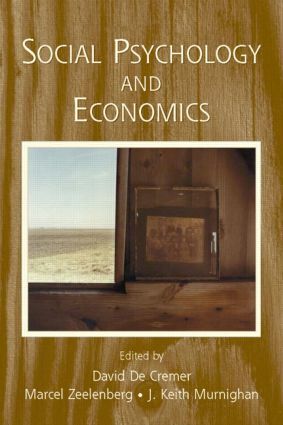 It addresses a variety of economic phenomena within a social context, such as scarcity and materialism, emphasizing the importance of integrating social psychology and economics. The market for this book is students, researchers, and professionals in the disciplines of economics, psychology, business, and behavioral decision making. Graduate students and upper-level undergraduate students will consider it a useful supplemental text.